Honored for visual appeal and experience, homepage design, and overall site experience, three of mStoner, Inc's website redesign partners take home silver awards. mStoner, Inc. is thrilled to announce W3 award wins for Saint Louis University, St. John Fisher College, and Wheaton College. For the past 12 years, the W3 Awards have recognized the power of web creativity. Each submission is sanctioned and judged by the Academy of Interactive and Visual Arts. The Academy is an invitation-only body consisting of top-tier professionals from a “who’s who” of acclaimed media, interactive, advertising, and marketing firms. Saint Louis University (SLU.edu) takes home two awards: Silver Award for General Website Categories-School/University and the Silver Award for Website Features - Home Page. According to SLU, a top 100 research university, “Discoveries — big and small — happen here every day.” Sharing those discoveries in an engaging way with prospective students was the main priority for Vice President of Marketing and Communications Jeff Fowler in relaunching SLU.edu. Since the launch of the new site, prospective students are accessing information and engaging more than ever. The number of sessions have increased by 7 percent, page views have increased by 3 percent, pages per session have increased by 43 percent, and time on site has increased over the same period a year ago. St. John Fisher College wins the Silver Award for General Website Categories-School/University. St. John Fisher College (SJFC.edu) in Rochester, New York, wasn’t bragging enough. Visit the stunning campus and you’ll immediately notice how much pride the students, faculty, and staff feel for their school. Fisher is outperforming its peers in enrollment and recently broke into the national rankings of the top 150 schools. Its graduates are known for their professionalism and its alumni engagement is strong. To brag more, however, it needed a better bragging toolkit — a beautiful website that translated the magic of their campus culture to every screen. An important measure of a redesign project’s success is how it affects a marketing team’s communication with other units and departments. In Fisher’s case, the project created stronger relationships and more cooperation. The site is getting a lot of traffic from students who are already accepted. The analytics suggest new students are spending time dreaming about what it’s like to be on campus and getting more and more excited to attend. For Fisher, this means better word-of-mouth publicity and strong numbers of natural brand ambassadors. 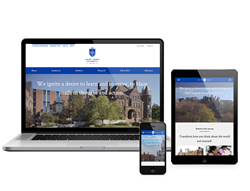 Wheaton College is awarded a Silver Award for Website Features: Visual Appeal – Experience. Launched in September 2017, Wheaton College's beautiful, new site (Wheaton.edu) shows well no matter what viewpoint, and better showcases academic programs to attract prospective students. The W³ Awards honors creative excellence on the web, and recognizes the creative and marketing professionals behind award-winning sites, videos and marketing programs.